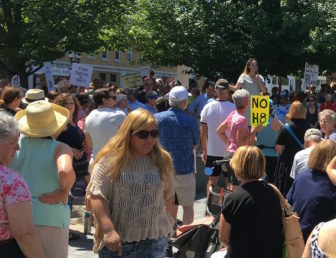 Nearly 300 people gathered Sunday at Chapel and Church streets in New Haven, one of several rallies around the state to protest white supremacist violence and hate. 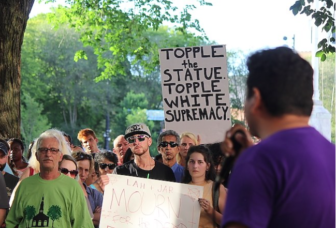 Washington – Connecticut may not be fertile ground for a white supremacist rally like the one that turned violent in Charlottesville, Va., but the state is not immune to hate. The Southern Poverty Law Center, headquartered in Montgomery, Ala., says there are several active hate groups in the state. Zrallack organized the Connecticut “White Wolves” shortly after his graduation from high school in Stratford. In 2004, ADL called the group “a collection of racist skinheads” that “has grown into the largest and most active extremist group in the state,” promoting an ideology espousing hatred of Jews and racial and ethnic minorities. “Members, though typically young, have been involved in a number of criminal acts in Connecticut and have forged ties with nationally recognized hate groups, including the National Alliance, the Creativity Movement, White Revolution and the Ku Klux Klan,” the ADL said. The White Wolves seemed to disband after Zrallack was arrested in 2010 and charged with conspiring to sell guns and hand grenades to an FBI informant brokering a deal for a Ku Klux Klan offshoot. A jury acquitted him of those charges. Zrallack then became one of the very first activists in the White Lives Matter movement in the spring of 2015, the ADL said. That movement was a reaction to the “Black Lives Matter” movement that grew out of frustration at a spate of police killings of black youth. A chapter of the ACT for America in Cheshire is also considered a hate group by the Southern Poverty Law Center. The group says it is planning a number of “America First” rallies across the nation on Sept. 9. The national group has condemned the violence in Charlottesville, which resulted in the death of counter-protester Heather Heyer. Jesus Morales-Sanchez, an organizer with Unidad Latina en Accion, speaks to the crowd Sunday in New Haven. Connecticut is more likely to hold rallies in support of those who are the targets of hate groups, like it did in the aftermath of the violence in Charlottesville, said Steve Ginsburg, ADL Connecticut regional director. He said white supremacists are “not a real force” in Connecticut, “but there are people in every state with extremist ideologies” who connect with others over the Internet. “I don’t think we are ripe to be the next Charlottesville, but I could be wrong,” Ginsburg said. The state legislature voted unanimously this year to toughen Connecticut’s hate crime laws. But still, there is evidence of hate in the state. 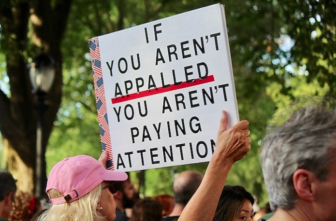 There are also dozens of hate crimes reported each year to the state police, a requirement of Connecticut’s hate crime laws. Reports from 2003 to 2012 show a slight increase in hate crimes, with 166 reported in 2012. But the FBI says that two-thirds – or more – of these types of crimes go unreported. Bridgeport author Andy Piascik, who has written about the Ku Klux Klan’s history in Connecticut, said its difficult for the United States to shake off the white supremacist movement. The latest Klan rallies in the state occurred in the early 1980s, but counter-protesters vastly outnumbered the marchers. Today, counter-protesters in Connecticut would significantly outnumber the white supremacists who rallied in Charlottesville, Piascik said. Editor’s Note: Matthew Zrallack’s name was removed from this story on August 2, 2018. In the original version of the story, Matthew was named by the Anti-Defamation League as one of the organizers of the Connecticut hate group, “White Wolves.” Since that time, the ADL has removed his name from its database, citing his peripheral role in the group, his youth at the time, and the many years that have passed with no subsequent involvement in the white supremacy movement.